Last week we posted an article talking about different ways that your eyecare practice can fight back against online retailers. Because when it comes to eyeglasses, a lot of your competition is online. Understanding why your customers are choosing to leave you for Internet frames is an important step of being able to combat a plan against those lost sales. We dug around and found some stats in a recent Hubspot article that explain some of the reasons why people are making purchases online, instead of in your optical shop. So let's take a minute and understand why exactly your customers might be making this decision. Why You Should Care: Based on this data, selection, price, and convenience are the three most important factors pushing people to purchase online. 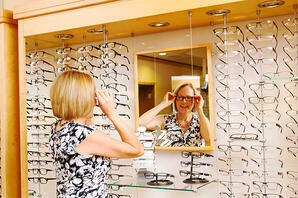 Larger selection and reasonable prices are both things to keep in mind as you purchase your frame inventory. Another way to compete on the price factor is making sure that your customers understand the value of the price they are paying for your services, products, and expert knowledge. So how do you make things more convenient for your customers? Maybe they find it inconvenient to have to come back to your office to pick up their prescription. Offer to mail their products straight to their home once they arrive. In a study conducted by Walker Sands Communications, a majority of consumers prefer to avoid purchasing items they will not use in the longer term in favor of more flexible renting options to save money or to give them the option to try a newer service. Why You Should Care: While you can't really "rent" out frames to your customers, what about offering a discount on new frames for patients who bring in and donate their old frames? This could be a great way to push consumers towards purchasing their next pair of frames in store with you, and is a way for your practice to give back to a good cause. Your consumers will be getting a price break (which as mentioned earlier, one of the top reasons they buy online), and they'll be happy knowing their old glasses are going towards a good cause. In a study from Quirk's Marketing Research Media, results showed that consumers rank a "person like yourself" as a highly credible source of information, indicating a shift of trust towards individuals and away from institutions. Why You Should Care: People like doing business with people they like and trust. And it's hard to find that sense of relationship with a website. Having team members that are able to build those trusting connections with your customers is one of the easiest ways to increase sales in your dispensary. We've talked about the importance of hiring the right employees for your practice, and have provided tips and tricks for hiring valuable candidates. But, we know the most qualified and personable candidates aren't always the first ones knocking on your door for a job, so it's important you don't rush into a hiring decision. Make time to find the right fit for your practice. Want more tips for your optical dispensary? Subscribe to the blog to keep up with the latest!